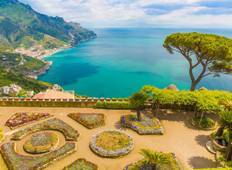 Find the right tour for you through Salerno. We've got 21 tours going to Salerno, starting from just 5 days in length, and the longest tour is 29 days. The most popular month to go is June, which has the most number of tour departures. "Alex (lead cyclist) and support driver Rafaelo were an excellent team. Our tour was..."
"It was a wonderful trip! Our very knowledgeable guide, Patricia O’Brien, went above..."
"Had an amazing time on tour." "I made the best decision ever , unforgettable experience . I had hung out, clubbing,..."
"The tour guides are first class on information on local knowledge of the area"